We want to educate voters so they know the facts about the CSFT and can make an informed decision on March 20th. 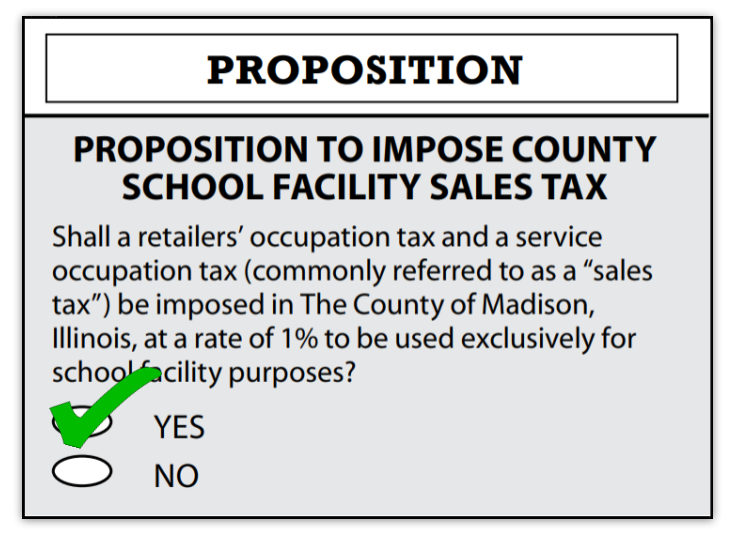 Why did Madison County School Boards adopt a resolution to put the county school facilities sales tax on the March 20th ballot? Why would individuals who pay property taxes in Madison County be interested in the County School Facilities Tax? I’ve heard that once the 1% sales tax is passed, our school districts can have Obligation Bonds that will grant them access to increase my property tax. How many counties in Illinois have passed the CSFT? What facility needs have been identified for our schools in Madison County, and would the new sales tax revenue completely pay for these needs? I don’t have children attending Madison County schools anymore. Why should I support this sales tax increase? Why did Madison County school boards adopt a resolution to put the County Schools Facilities Tax on the March 20th ballot? Most of the Boards of Education in Madison County wanted to give voters the opportunity to decide if a one cent sales tax should be imposed exclusively to pay for school facility purposes. The sales tax is a state approved alternative method to pay for school facilities instead of relying heavily on local property taxes.. Therefore, new revenue would allow Madison County schools to break the grip of property taxes on local school finances. It is estimated that 30% of sales tax is generated by non-county residents. Why would individuals who pay property taxes in Madison County be interested in the County Schools Facilities Sales Tax? Property owners bear the heaviest burden of paying for school facility maintenance, renovations, construction, and improvements. Currently, school districts must issue debt to pay for larger school facility needs which is funded through property taxes. The sales tax is alternative way to “share” the cost with visitors shopping and staying in Madison County, who will contribute an estimated 30% of annual CSFT revenue. There is a lot of misinformation and inaccurate statements that the CSFT will raise your property taxes. The truth is that the CSFT and property tax relief is a package deal. It is designed to lower property taxes and reduce the property tax burden in Madison County. In 2014 the Charleston school board in Coles County promised to pay off (retire) the Health/Life Safety bonds. They accomplished this during the 2014-2015 school year which resulted in the removal of the $1.03 bond/interest levy. 2015 property taxes went down $343 on a $100,000 home in Charleston because the school district paid its outstanding debt. Click here to see how this can affect property taxes in YOUR district. The CSFT is a fair deal for taxpayers because it is collected from all consumers, rather than just property owners. Home values rise and fall, subjecting local school districts to unfair budget turmoil. The 1% sales tax is spread over a much larger number of people including those who pass through the county, which proportionately decreases any impact on the local consumer. Also, depending on home values, what the average person spends in sales taxes on an annual basis is usually far less than their property taxes. The CSFT funding method will reduce the need for the school districts to rely heavily on the property taxes for school facilities. We must break the grip property taxes hold over local school finances. Vote YES on the CSFT to retake local control from Springfield and property taxes at the same time! If the 1% sales tax is approved, there will be virtually no need to issue bonds that are paid by property taxes. The sales tax is estimated to generate almost $23 MILLION in revenue for our school facility projects. This eliminates the need for bond financing. For example, a $500,000 health life safety project to replace the HVAC system at any Madison County District would be funded by the sales tax instead of property tax. Currently, there are 49 counties that have approved the CSFT in the State of Illinois. Most recently, nearby Macoupin, Bond, Monroe, and Jersey counties have approved the county-wide sales tax. In the November 2016 election, eight counties had CSFT on the ballot, and all eight counties passed the measure. Items taxed include “general merchandise” as defined by Illinois Department of Revenue. For a definition of general merchandise, click here . Most of the school districts in Madison County have identified priority needs that would be funded through the CSFT. Over the past several years, the school districts have deferred many needed projects due to budget constraints. These are not frivolous “wants” but desperate needs.Click here to see more about what each district plans to do with the revenue from the CSFT. Whether you are a senior citizen, a limited-income family, or have no affiliation to our school districts, all homeowners pay property taxes which is the primary funding source for the community’s public education. Anyone who pays property taxes in Madison County will reap the benefits of the shared sales tax, for other people living outside of Madison County are contributing toward public school facilities. Investing in school improvements and construction in Madison County has the potential to boost our local economy. Many projects funded by this sales tax will put people to work across the county. Excellent school systems with quality facilities and learning environments are a key factor in attracting families to live within our county. School facilities: This dedicated revenue source will keep schools and classrooms maintained for safety, security, and sustainability. Jobs and economic growth: Many projects funded by the sales tax will put local people to work and support local businesses throughout Madison County. Local control of funds: Every school district will control how it uses this tax revenue through the elected school board members who represent each school community. Shift away from property taxes: A sales tax represents a shift away from property taxes. School districts would become less reliant on property taxes with options to pay off existing bonds or avoid new property taxes. Funding from outside our county: Visitors to Madison County will support schools with their spending. An estimated 30-40% of sales tax revenue comes from non-residents shopping, dining, and staying in Madison County. Quality of life: Schools play an important role in attracting families to settle in our communities. Attracting new families and retaining our current residents help to ensure a positive future across Madison County. The revenue provided by the sales tax will mean an improved learning environment including an emphasis on safety and security for students across the county. Buildings will be maintained to increase their future years of service to our community. This revenue will allow Madison County school districts to provide the facilities necessary to support a 21st century education, which is critical to ensuring that our students have the tools they need to compete in a changing economy. You can contact Citizens for Madison County Schools by emailing us at onecentmakessense@gmail.com or by contacting your local school district administrative office.